If you have recently had an upset stomach or diarrhea, your doctor may suggest that you limit your diet to bland foods that won’t irritate your stomach. The BRAT diet is a bland-food diet that is often recommended for adults and children. BRAT stands for Bananas, Rice, Applesauce and Toast. The BRAT diet can help you recover from an upset stomach or diarrhea for the following reasons: It includes “binding” foods. These are low-fiber foods that can help make your stools firmer. It includes bananas, which are high in potassium and help replace nutrients your body has lost because of vomiting or diarrhea. When should I follow the BRAT diet? 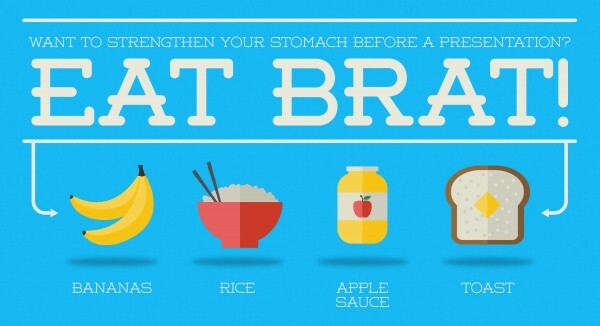 After you have diarrhea or vomiting, follow the BRAT diet to help your body ease back into normal eating. This diet may also help ease the nausea and vomiting some women experience during pregnancy. You can add other bland foods to the BRAT diet. For example, you can try saltine crackers, boiled potatoes or clear soups. Don’t start eating dairy products and sugary or fatty foods right away. These foods may trigger nausea or lead to more diarrhea. When should I avoid the BRAT diet? Solid foods, like those in the BRAT diet, are not recommended for adults or children who are actively vomiting. Instead, stick to clear liquids at first and wait until you can eat solid foods without vomiting. If you have been vomiting or have diarrhea, drinking an electrolyte beverage (some brand names: Pedialyte, Rehydralyte) can help protect against dehydration. Use these products according to your doctor’s instructions. How long should I follow the BRAT diet? Both adults and children should follow the BRAT diet for only a short period of time because it does not provide all the elements of a healthy diet. Following the BRAT diet for too long can cause your body to become malnourished. This means you are not getting enough of many important nutrients. If your body is malnourished, it will be hard for you to get better. You should be able to start eating a more regular diet, including fruits and vegetables, within about 24 to 48 hours after vomiting or having diarrhea.